On July 12, the Public Utility Commission, by a vote of 3-2, denied our application to operate as a common carrier in Pennsylvania. We are grateful that finally, after months of delays, a decision has been made. However, we are disappointed that their research included faulty information and their response included questions that could have been easily answered if they had asked us. Their decision means that we are unable to operate according to our business model of selling tickets for our sightseeing and food tours. Our temporary “by donation to a non-profit” tour model is not sustainable for the long term. If we can raise $4,000, we will hire legal counsel to petition the PUC to reconsider their decision. A lawyer who formerly worked for the PUC has offered her services to us. Please consider giving whatever you can. If we do not reach our goal, we will refund all contributions. In the past few days since the PUC's ruling to deny our application, we have received an amazing amount of support from the community. Everywhere we go with the tuktuk (or even a tuktuk T-shirt), people are stopping to express their dismay, concern, and best wishes. We appreciate the thumbs-up, honks, and "Keep fighting" comments that you all are sending our way. 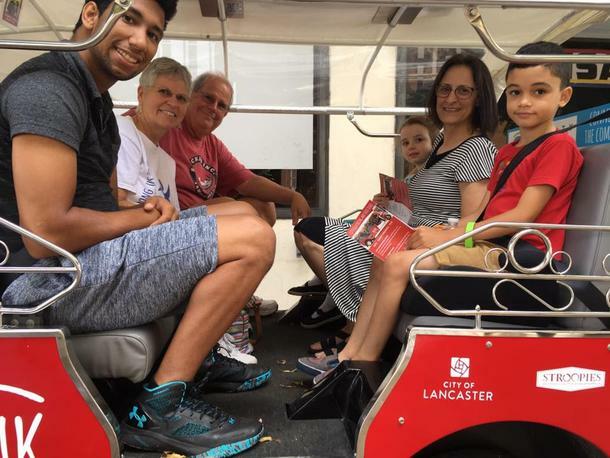 This is Lancaster's tuktuk and we'll do all we can keep it here. Clarification: some media outlets have announced that the PUC is "shutting us down" or has "ordered us to close" by July 22. While that makes for exciting headlines, it is not what we have said, nor is it true. The PUC has rejected our application to receive any direct or indirect compensation from riders, period. Tuktuk can still operate as a business without a PUC license indefinitely if we can figure out a business model that does not require ticket sales. We chose the July 22 date to allow us time to regroup and figure out next steps. In the end, we may need to close if we cannot find a sustainable new plan. We appreciate the media's coverage, even when we need to clarify their remarks!